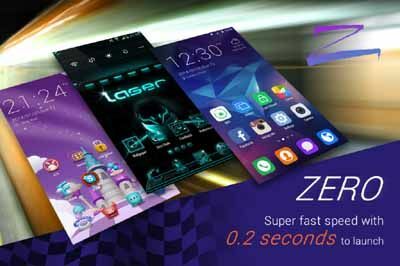 Free download Zero Launcher APK latest version. It is a free android launcher that replaces the stock launcher of android operating system. It changes the visual layout, graphics, effects and icons of apps. You may say that Zero Launcher is a theme for android smart phones but there is a small difference. Zero Launcher supports many themes provided by Zero Launcher i.e. it allows you to install themes on your smart phones as every launch does so. Zero Launcher has some advantages on other launchers as it makes your phone far faster than before, using your stock launcher. Some mostly used features are added in Notification bar including facebook, camera, ram cleaner, torch light, screen brightness, WiFi and data connection. So you may use your desired feature from the notification bar according to your need. Zero Launcher runs your android smoothly and fast. The reason of its fast speed is its small size and moreover, it does not have a menu containing all of your apps as the stock launcher does. All of your icons will be shown on the home screen wallpapers. The visual graphics are also cool as well. You can download more wallpapers and themes provided by Zero Launcher by tapping the icon labeled as wallpapers. From preferences icon you may change the settings of the launcher as icon styles and effects etc. It provides all of its features, themes and wallpaper free instead of other launchers. Zero launcher is offered by Zero Team in just a small size of 1.8 MB. So it is a cool and nice app for you if you are tired of your stock launcher and theme. Zero Launcher is a good addition in android apps for the change lovers. For offline installation Zero Launcher version 1.2 is given in the link below. You may download the latest version from google play store if you want. How do you remove certain features/items in the notification bar (such as Facebook)? Can you choose which items appear in the notification bar? Thanks.